A Raspberry Pi (mine is an RPI 3) requires a MicroSD card to boot, but once booted it is not required any longer. This is great because while very convenient, a MicroSD card is not as robust and hardy as a regular SSD card or even a regular USB flash device. One of the things that I therefore do is to run my RPI’s on either SSD or a USB thumb drive. I’ve also run mine with a 1TB external spinning rust disk with external power. The technique illustrated here works on all of these. My e arlier post described the RPI boot process. The picture here shows a simple MicroSD card image for an RPI. The disk is partitioned into two parts, the first partition is a small FAT32 LBA addressable partition and the second is a larger ext4 partition. The FAT32 partition contains the bootloader and the ext4 partition contains the root filesystem. Since the RPI always mounts the MicroSD card as /dev/mmcblk0 and the partitions are numbered p1, p2, and so on, this indicates that the root partition is the ext4 partition as shown above. To move this to a different location is a mere matter of adjusting cmdline.txt (and updating /etc/fstab) as shown below. Here is my RPI with a USB thumb drive running the root (/) filesystem. As you can see, I have a USB drive which shows up as /dev/sda and the MicroSD card. /dev/mmcblk0p1: LABEL="BOOT" UUID="E4F6-9E9D" TYPE="vfat" PARTUUID="01deb70e-01"
/dev/sda1: LABEL="root" UUID="7f4e0807-d745-4d6e-af6f-799d23a6450e" TYPE="ext4" PARTUUID="88578723-01"
I have changed cmdline.txt as shown below. and updated /etc/fstab (on the USB drive) as shown below. As you can see, I’ve also marked the MicroSD card (which provides /boot) to be readonly; in the unlikely event that I have to modify it, I can remount it without the ‘ro’ option and make any changes. On the left hand side is the MicroSD card. Note that on the MicroSD card, in the FAT32 partition, cmdline.txt is in ‘/’ (there’s no /boot on the MicroSD card). the cmdline.txt points the root partition to /dev/sda1 which is the USB flash drive. On the right hand side is the USB flash drive, it has an ext4 partition with an /etc/fstab entry which mounts the MicroSD card’s fat32 partition on /boot and mounts itself on /. This works just as well with any external disk; just make sure that you have adequate power! This is a two part blog post that covers a lot of topics about a rather boring aspect of the RPI. I suspect that the vast majority of people using a RPI wouldn’t be interested in most of this stuff. But, there are a small number of people out there (like myself) who will no doubt find this stuff very useful. This (the first of two) posts covers the booting process of an RPI. You need to have some idea of how this works to make your own images. I have a RPI 3, some of this stuff may not be accurate for other models. I have not been able to find any documentation on the bootloader that runs in the firmware but by trial and error, here is what I’ve found. The firmware accesses the partition table on the MicroSD card which it assumes is an MS-DOS style partition table. The partition table is at the very beginning of the card and is part of the Master Boot Record (MBR). A good write up about this layout is found here . The bootloader looks (it appears) for an MS-DOS LBA addressable partition. I have found that partition types 0x0C and 0x0E work. In order to boot reliably, I have also found that this must be the first partition on the disk. RPI’s don’t use bootstrap code on the MicroSD card. This is very important to if you wish to make your own images; it makes that process a whole lot simpler. The bootloader in firmware looks instead at this small MS-DOS partition to find a kernel, all the drivers it needs, and a pointer to the root file system. The bootloader parses the cmdline.txt file to find the root partition. Here is a small portion of the cmdline.txt on one of my RPIs. The RPI addresses the MicroSD as /dev/mmcblk0 and the partitions on it are (in order) addressed as /dev/mmcblk0p1, /dev/mmcblk0p2, and so on. The cmdline.txt file identifies the root partition either by providing this name, or by specifying a partition UUID, or a label. 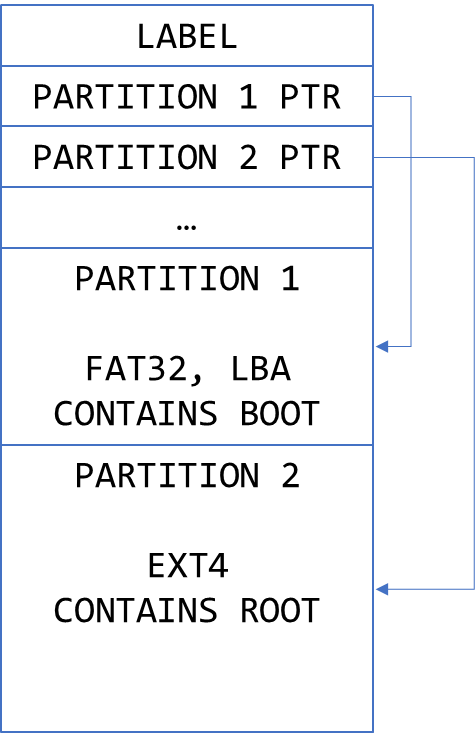 In the example above, cmdline.txt points to the second partition on the MicroSD card. I found exactly one place that appears to document this in some detail, that is here. When you power on the RPI, the red light indicates power. The green light (ACT/D5) indicates SD card access. If the red light comes on but the green one doesn’t it means that the firmware did not find a card it liked. This has been the most common problem described by people online. If you have the tools to debug it, here are some things that I have found to be helpful. If you can put this MicroSD card into a machine where you can mount it (and hopefully that machine is Linux based; if it is Windows based, my apologies, I can’t help you). lsblk will help you identify the device. For example on my machine it is /dev/sdc. Here is the output of lsblk on my machine. The MicroSD card is shown in bold letters. As highlighted above, the partition table is ‘msdos’ and the partition is shown as ‘fat32 lba’. Both of these are essential. Here are some examples of a closer look at the MicroSD card using hexdump. The thing I’ve highlighted is the byte at offset 0x1c2 into the card, here it says 0x0E. That is the code for a Fat16 LBA mapped partition table. On another RPI, I have the following. Both of these work well for me. If you don’t see one of these, look up the number you do see here . If it is not a MS-DOS LBA-mapped partition type, you have a problem. If you made your own SD card and you have the image file handy, you can inspect it to see what it has as follows. Here is an image I built for myself. It is a 2GB Raspbian clone that I use for some of my machines. 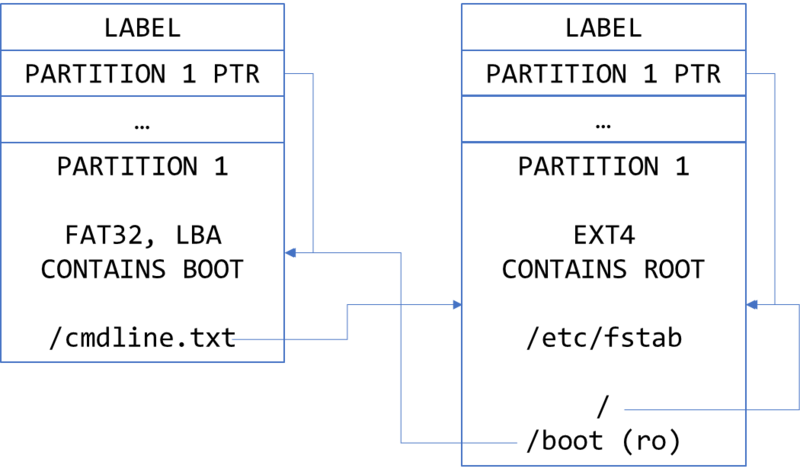 It contains two partitions, the output below shows offsets and sizes in Bytes because of the ‘unit b’ command. Armed with that information, you can now do this. /tmp/boot and /tmp/root now mount the MS-DOS and ext4 partitions in the image using loopback file systems. This is very useful in debugging. You can, of course, do the exact same thing on a MicroSD card and make corrections to the card if you so desire. The next installment of this blog post will describe how you can build your own images.